The City and Guilds Level 3 Diploma in Veterinary Nursing (Equine Pathway) requires Student Veterinary Nurses (SVNs) to undertake a placement, paid or unpaid, for a minimum of 15 hours per week within an approved RCVS Training Practice (TP). As an approved RCVS Training Centre, we can arrange the approval process for UK and overseas practices. You can still enrol your SVNs with TOCES if your practice is already a TP with another Primary Centre or you have SVNs training with another college. Step 1 – Check the eligibility of your potential student equine veterinary nurse/s. Please follow the link to the City and Guilds Level 3 Diploma in Veterinary Nursing (Equine Pathway) information page for entry criteria. Please contact us with any particular queries you may have about this. Step 2 – Download, complete and send the Training Practice Application Form, Checklist for Training Practices (UK or International as appropriate) and Terms and Conditions documentation to admin@equinestudies.co.uk or to our postal address. Step 3 – Upon receipt of your completed forms we will invoice you for Training Practice affiliation fee. 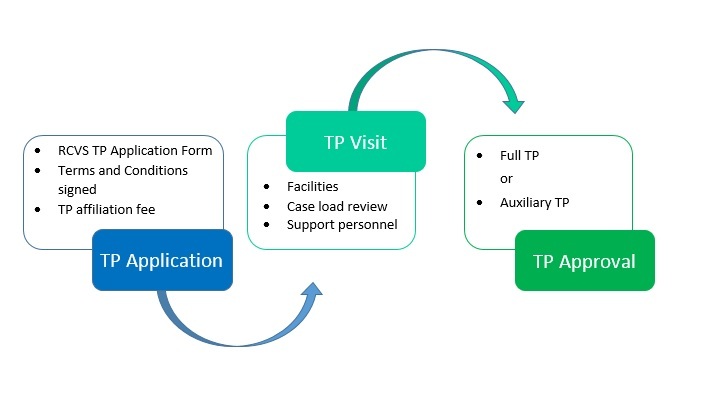 Step 4 – After reviewing your application, we will liaise with the practice to arrange a TP visit for UK practices or, for international practices, to gather the necessary evidence to submit the application to the RCVS for approval. If your practice does not meet all of the requirements for full TP approval it is possible to apply for auxiliary training practice (aTP) status. For example if the practice lacks full surgical facilities or has a low case load, an arrangement can be made for SVNs to be seconded to another suitable training practice to gain the necessary experience. In some instances, and with prior arrangement, it may be possible for international students to complete secondment placements whilst in the UK for study weeks, in order to increase exposure to caseloads for completion of the NPL. In such cases a Memorandum of Understanding is drawn up between TOCES, the aTP and the secondment practice to outline the exact arrangement between the parties involved. Please contact us if have any queries regarding this.